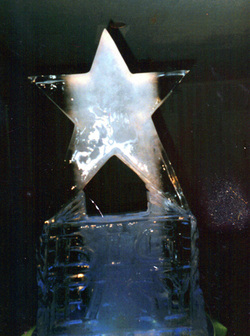 This is the ice star for Big Easy Entertainment awards ceremony made by Mr.Jazzy. Armstrong Park Grand opening contest for a food sculpture - he made a bust of Luois Armstrong and it was given to Satchmo's widow after the party. First Place for an ice sculpture in the competition at New Orleans Culinary Institute.